In DUAL and PARALLEL mode, the level controls LEVEL on the power amp’s rear panel are used to control the amplification of the corresponding channel. Turning the control to the right increases and turning it to the left decreases the volume. In BRIDGED mode operation, the output volume for a pair of outputs is only controlled by the level control of the channel with odd number (1, 3, 5 or 7), the setting of the channel with even number (2, 4, 6 or 8) is ignored. The PROTECT LED lights indicating that one of the internal protection circuits against thermal overload, short-circuit, Back-EMF, HF-occurrence at the output, etc., has been activated. In that case, the connected load is seperated from the power amps to prevent the connected loudspeaker systems and the power amplifiers as well from being damaged. Whatever caused the fault – e.g. a short-circuited speaker cable – needs to be remedied. In case of thermal overload you have to wait until the power amplifier automatically regains normal operation. The MUTE LED lights red whenever the power amp’s output signal is being muted, which happens when manually muting the output signal via IRIS-Net™. Level indication is realized via vertical LED chains on the power amp’s front panel that individually indicate the actual levels of each channel at -30dB, -10dB and -3dB below full modulation. The LIMIT LED lights as soon as the integrated dynamic audio limiter is activated and the power amplifier is driven at the clipping limit or generally at its maximum capacity. Short-term blinking is not a problem, because the internal limiter controls input levels of up to +21 dBu down to a THD of approximately 1%. If, on the other hand, the LIMIT LED light constantly, reducing the volume is recommended to prevent the loudspeaker systems connected from being damaged by probable overload. The POWER LED lights green when the power amplifier is on. If the POWER LED does not light, despite the fact that the amplifier has been switched on, this indicates that the power amp is not connected to the mains or primary fuse has blown. The STANDBY LED lights yellow when the power amp is in standby mode. Standby mode reduces the amp’s power consumption to an absolute minimum. Activating the standby mode is possible via IRISNet™ or the POWER REMOTE port at the amp’s rear panel. The IRIS-Net LED lights blue if an IRIS-Net™-compatible remote control module has been installed in the power amp’s extension slot and successful data communication has been established. 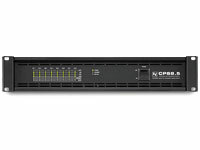 The IRIS-Net LED blink slowly whenever the "Find" function in IRIS-Net™ is being used to locate a power amplifier in the rack. POWER REMOTE provides a simple way to remotely power-on/off the power amplifier. The POWER REMOTE function is only useful for appliances not employing a Remote Control Module. Controlling CPS amplifiers with Remote Control Module installed per POWER REMOTE is not recommended. Leaving the pins of POWER REMOTE socket open the appliance power is switched on. When connecting the pins the appliance enters standy mode.